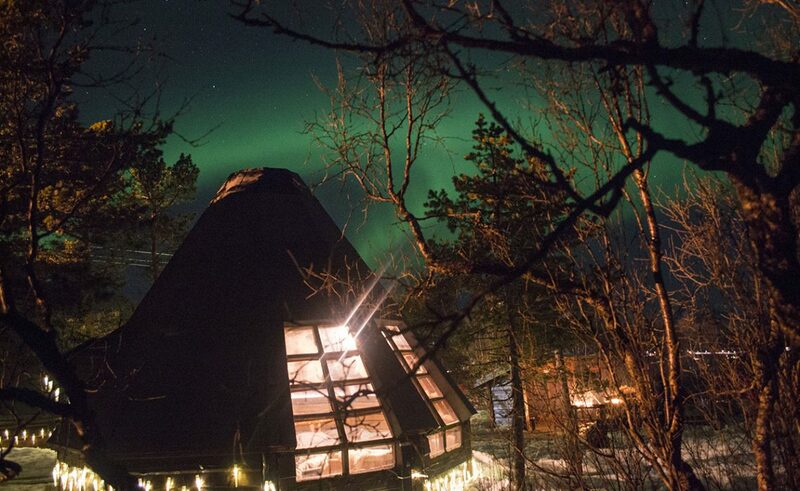 The fact that Norway is an expensive destination to visit isn’t exactly the world’s biggest secret. 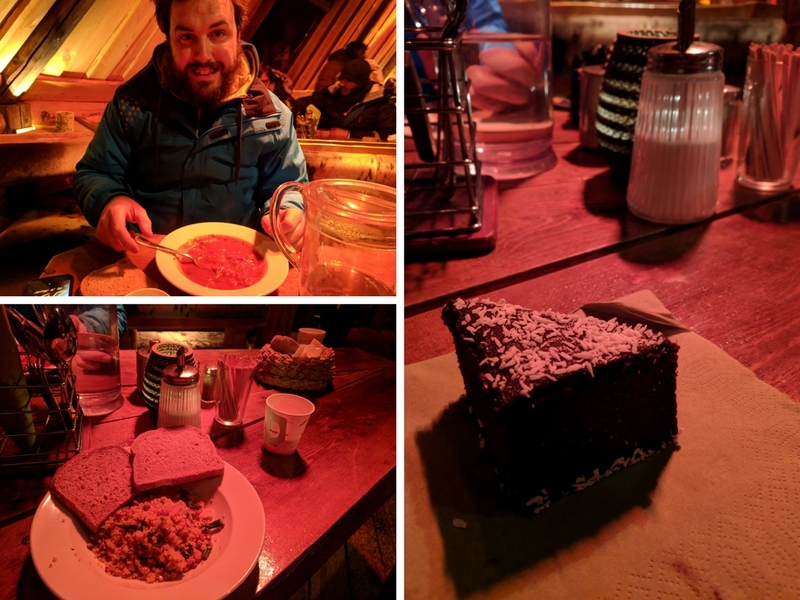 I found that one of the best ways to get the most out of my Tromsø trip (without going completely broke) was by combining experiences. 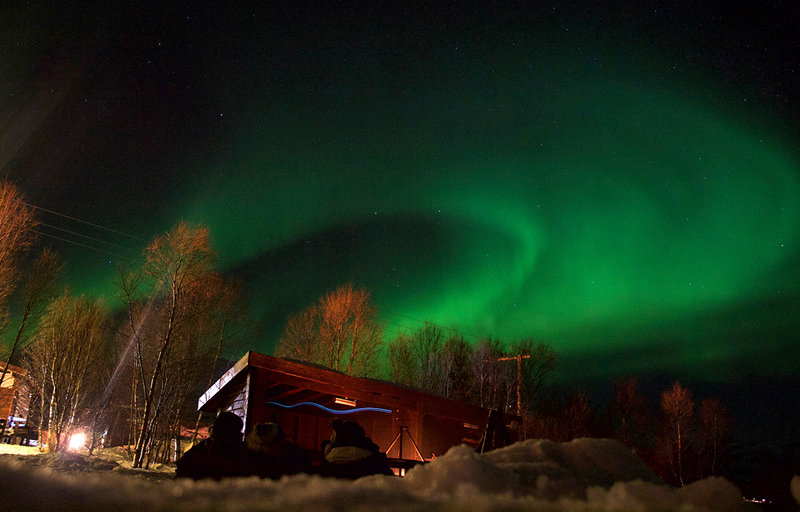 And that’s exactly how I ended up at the Tromsø Villmarksenter base for an evening of cuddling huskies and gawping at the skies in the hope of seeing the whimsical flurry of the Aurora Borealis. Could there ever be a more sensational combo?! No matter what time of year you visit, if you want to see more of Tromso than just the city centre you’ll probably stumble upon Tromsø Villmarksenter. The company started out in 1988 as a home for dogs, and has since flourished into one of the biggest adventure companies in all of Norway, offering everything from dog sledding trips to mountain hikes and kayaking. 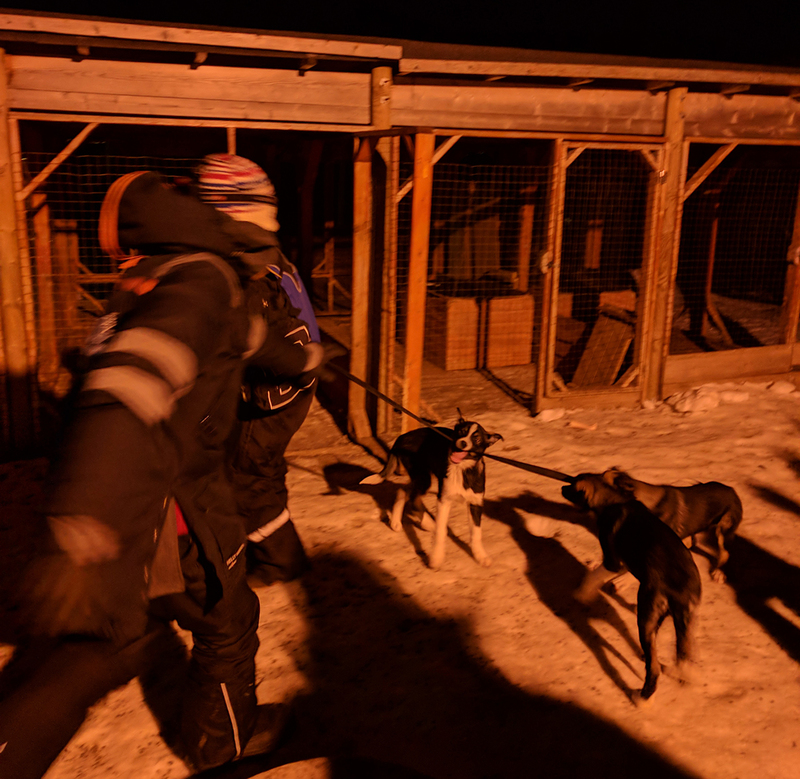 It was their Aurora Husky Visit which really caught my eye though (as much as Ian and I were tempted to try out dog sledding, we knew that with our track record we would end up falling off the sled and squashing a poor dog or something). 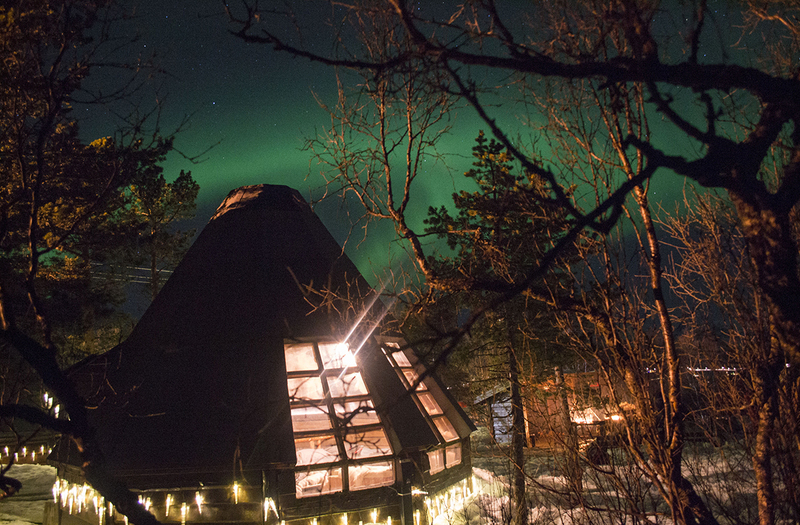 Comfort is at the forefront of the entire 4-hour evening trip, starting with a 25-minute coach trip from the centre of Tromso out to the centre’s base on nearby Kvaløya, the whale island. After arriving at the Tromsø Villmarksenter base, everybody was hurried out of the cold and into a wooden cabin to get suited up. I quickly learnt in Tromso that no matter how well dressed you are for the cold, you are always, always underdressed. No buts. So, despite a snow jacket and ski trousers, I squeezed myself into a padded winter overall, feeling like an oversized Teletubbie who’d indulged too much over Christmas. 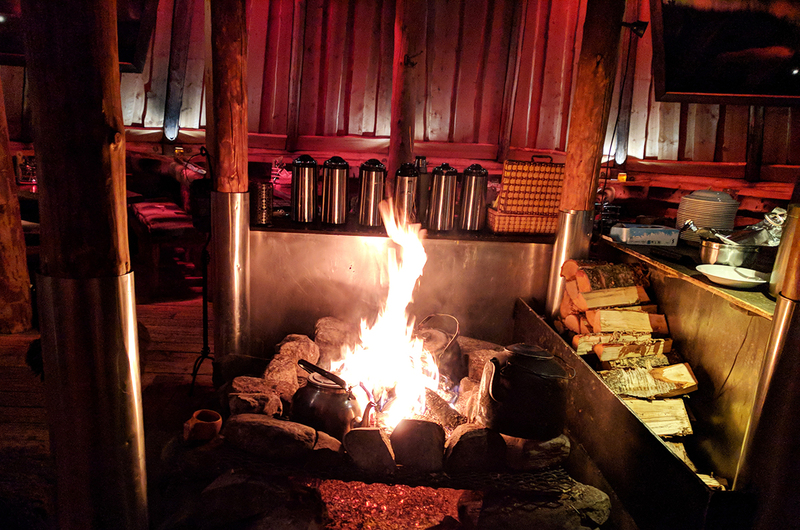 My gracious waddle out of the cabin and over to my half of the group’s fireside seating was probably the most exercise I got over my entire time in Tromso! 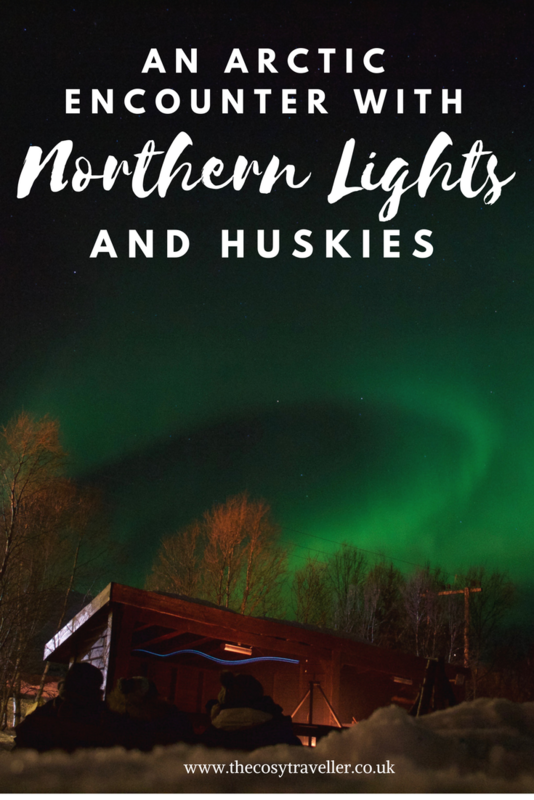 Around the campfire, our guide began to tell us more about the Northern Lights, from just how they’re created to how they’ve been interpreted over the years by various cultures. 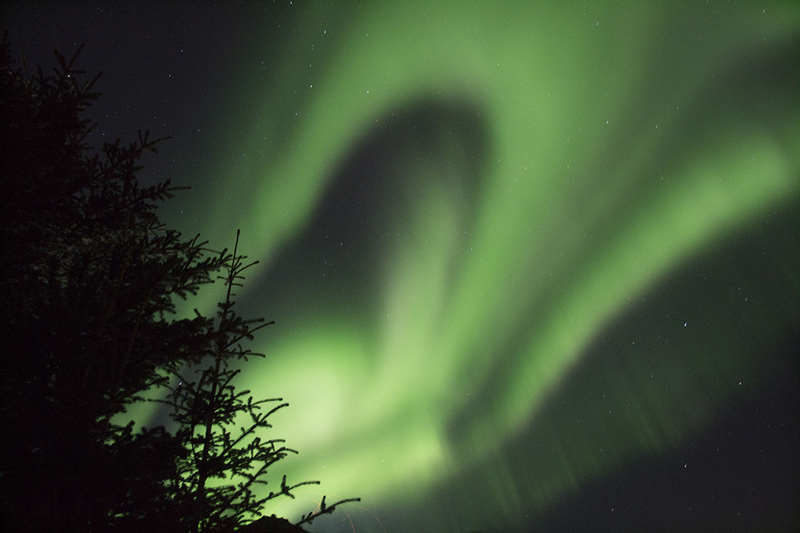 Turns out, the current knowledge that the Aurora Borealis are actually collisions between electrically charged particles from the sun is pretty dull compared to what our ancestors used to believe. Cultures have thought the lights were everything from dead ancestors, to spirit guides holding torches to direct the recently departed to the next world. 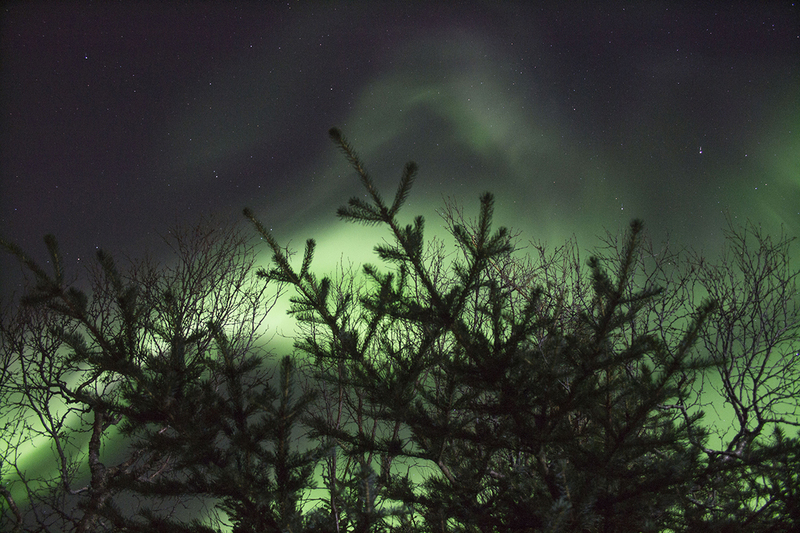 As we kept checking the skies (in-between roasting marshmallows over the fire) I saw the familiar faded band of the Northern Lights from the night before – barely visible by the naked eye, but the camera picked up tiny wisps of green. 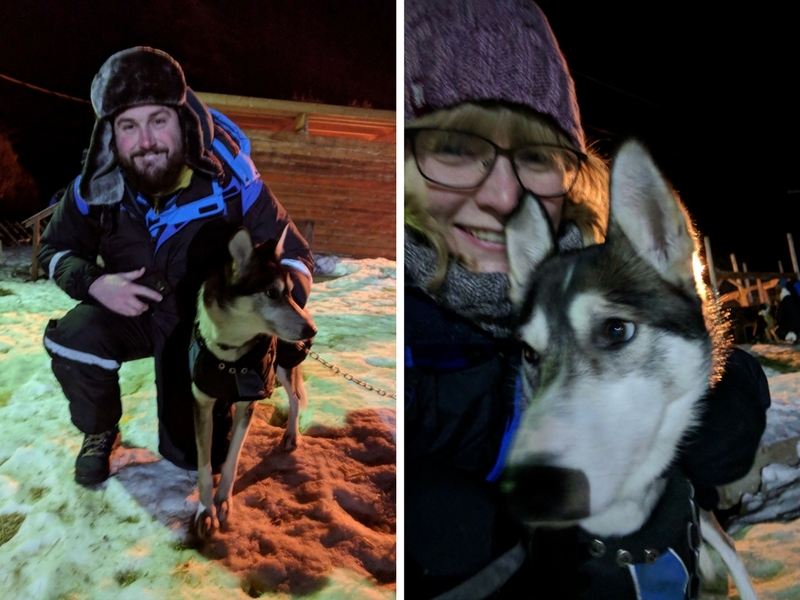 I genuinely thought this was the best we were going to get, so happily bundled along to meet the hundreds of huskies with the rest of our group. Imagine you. In a field. Surrounded by 300 huskies. Sounds like heaven, right? And it was. All of the centre’s dogs live outside in little wooden huts. This might sound like hell to you and I, but in reality this is a dream for huskies. 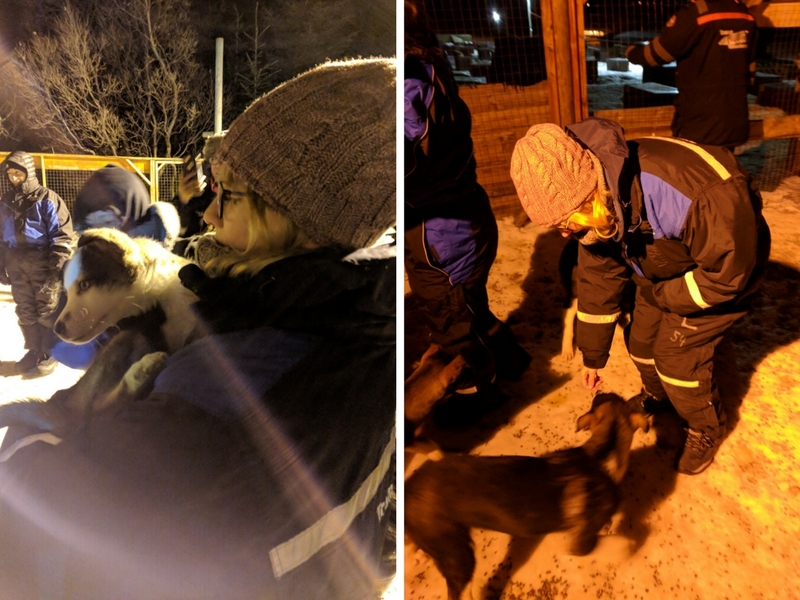 Thanks to their thick coat, they thrive in below freezing temperatures (although we did spot some adorable huskies with little jackets on to give them a little extra protection against the cold). Our guide told us to knock ourselves out with the dogs, and Ian and I didn’t need to be told twice. Some of the dogs were sitting on top of their little houses, others were standing outside, staring at you and wondering why you weren’t coming over to cuddle them immediately. The huskies are so friendly, that you can quite literally just go up to any of them for hugs, dog kisses, selfies – the full works. If you’re visiting at night though, just be aware that the light isn’t the best, so photography can be a little tricky. 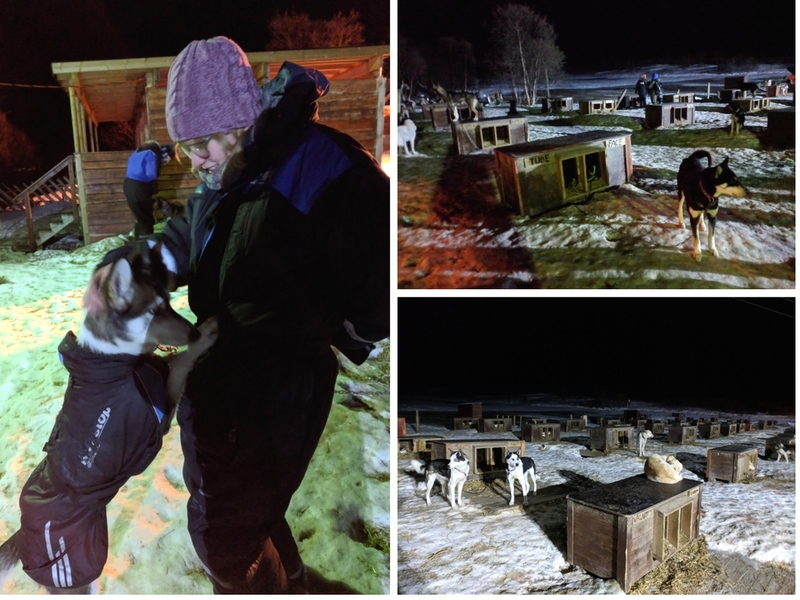 Once the group before us was finished, we were all led into a small paddock next to the field in order to meet the newest additions to the husky team – the puppies. 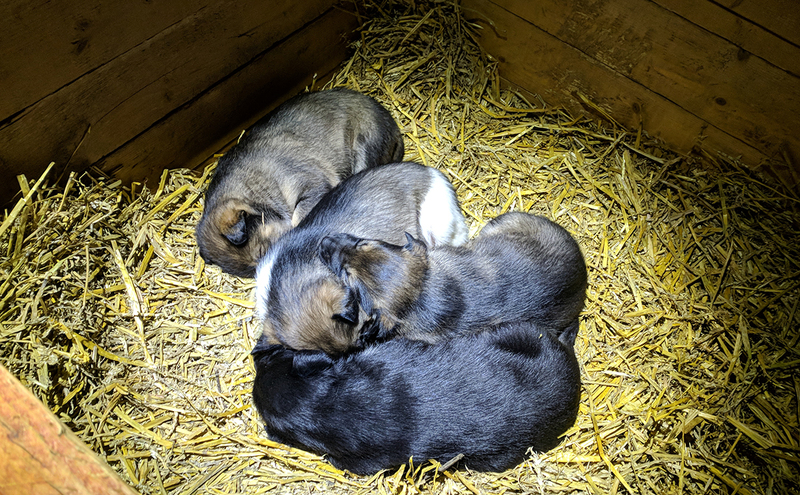 There were cries of “oohs” and “aaahs” as the 4-month old rascals ran around our feet in an attempt to get us to play with them. We all even got the opportunity to hold some of the puppies, although I don’t think mine was very taken with me and just wanted to be reunited with the ground! One woman’s bag straps became the centre of excitement with two playful pups, who grabbed hold of them in what turned into a game of tug and war between them and our guide. My inability to stop laughing was punished later on when one of the bigger dogs grabbed hold of my thermal glove and ran off with it (to be fair, I couldn’t stop laughing then either…). Moral of this story? Keep your items close to you, and away from the dogs! Once we’d met the dogs, we realised it was only about an hour before we had to be heading back on the coach. Ian and I decided to get out of our bulky thermal suit, and walk on over to the camp for our dinner. Just as we were mid de-suiting, our guide ran in to the changing area in a frenzy, shouting “The lights have got even stronger now!” He grabbed our suits from us to hang up and we ran out into the open again – and that’s when we saw them. Even brighter than the night before, the lights had exploded into the sky. Seemingly drifting from the manmade lights on the horizon, they were swimming all the way over to us. And they were no longer just limited to that faded band of light grey; they were dancing over our head to the left and the right, darting backwards and forwards in an outburst of greens and purples. Just when you thought you’d seen one spectacular display that couldn’t be topped, you’d look elsewhere and see the ethereal lights darting around like keys on a piano being played. It was like they’d come out to play just for us. 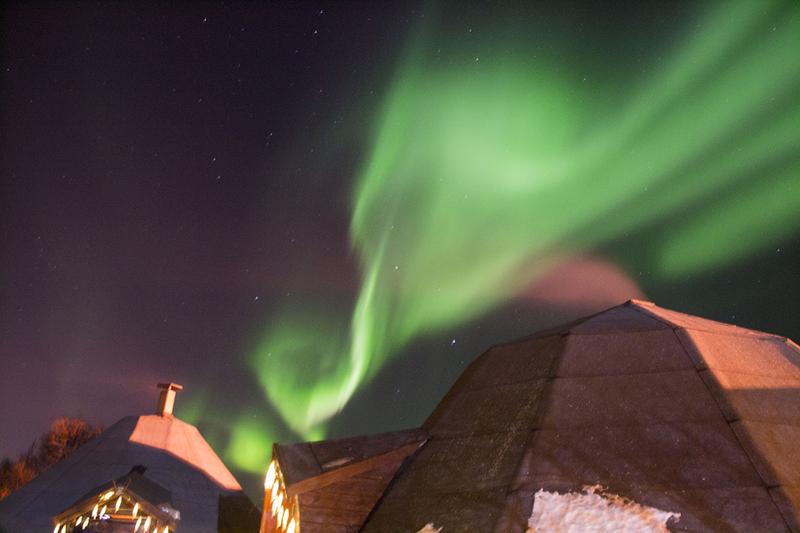 More and more people rushed out of the huts, leaving their dinner to get cold in order to get a glimpse; for many it was their very first time seeing them, and you could tell they were blown away by the sight unfolding in front of them. You never really know how you’re going to react when you see them. Some people were crying out, “It’s a miracle!”, others stood in humbled awe, and others (like me) just keep taking sharp intakes of breath while repeating “OhMyGodOhMyGod” over and over again. Although our ticket said that tripods would be available to rent so that we could photograph the lights, when I asked there were none available. Not one to be perturbed, however, Ian used everything steady around him – from the branch of a tree to a snow mound – to his advantage. I don’t think the pictures turned out too bad considering, do you?! We were lucky that the lights stayed visible for the rest of the time we were at Tromso Villksmarkcenter, although that first flurry was the strongest we got. Later on when we were leaving, I overheard a guide telling another visitor that he’d never seen them that strong the entire season – and that they rarely got better than that. In that moment, I couldn’t quite believe just how lucky we’d got with all the cogs falling into place. Once the lights started to die down a little, Ian and I tore ourselves away from staring at the sky in order to get warmed up. 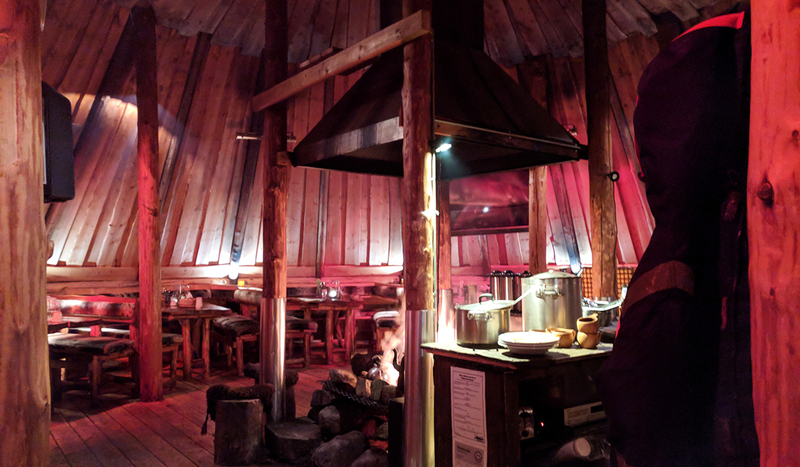 The cosy traditional round house at the base is where meals are served (all included in your ticket price) around a roaring open fire. Ian got a fish stew (“very fishy but nice” were the exact words of his review), while I got the vegetarian alternative of couscous. It was a little dry – especially along with the side of bread – but still tasty. And, to be honest, it was just nice to be getting something warm in my tummy. I hadn’t realised just quite how cold I’d got standing outside. The real highlight was the chocolate cake for dessert, which was (apologies for this next phrase) deliciously moist. And chocolatey. Everything you want from a spot-on piece of chocolate cake. By the time we’d finished, it was time to bid Tromsø Villsmarkcenter farewell. We bundled onto the warm coach for the return journey back to the town centre, waving goodbye to a husky puppy in one of the staff’s arms. There are few nights in my life that could top this entire evening; even now it still seems like a (very cold) dream that didn’t really happen. 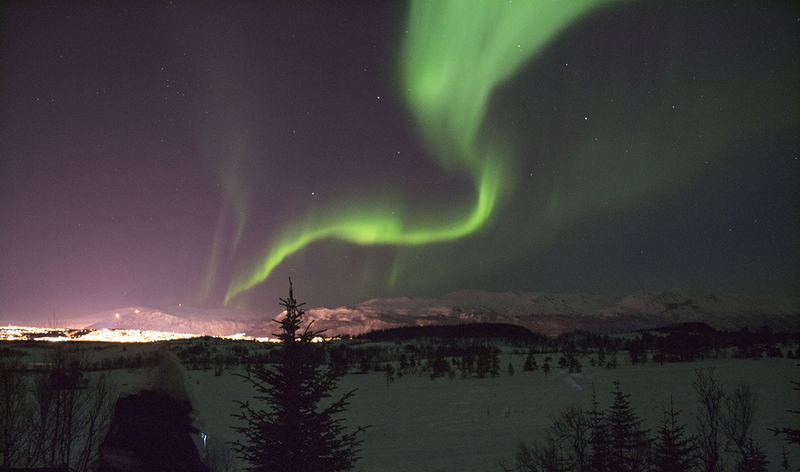 It was just so, so perfect in so many ways – and I hope if you’re heading to Tromsø soon you’ll all get a similar experience like mine to remember forever. 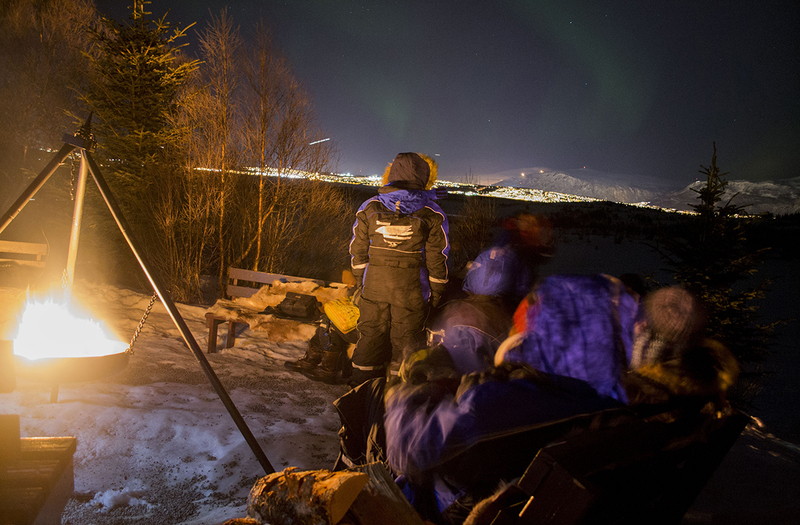 Information: The four-hour Aurora Husky Visit with Tromsø Villmarksenter costs 950 NOK (around £87) per person, with kids aged 4-12 going for half price. The tour runs from 23rd October – 25th March. Disclaimer: I was given a media rate for the purpose of this review. However, all opinions are my own!